Yesterday Marvel announced a new partnership with Netflix that will develop four series and a mini-series based on Marvel characters. These live action shows are set to start Daredevil, Jessica Jones, Iron Fist, and Luke Cage. The press release goes on to say that Netflix has committed to “a minimum of four, thirteen episodes series and a culminating Marvel’s “The Defenders” mini-series event that reimagines a dream team of self-sacrificing, heroic characters. It’s an exciting announcement and it raises a lot of questions. For budget reasons, it was smart for them to focus on some of Marvel’s street level heroes. The group of characters they picked play pretty nice together. Luke Cage and Iron Fist are the Reese’s Peanut Butter Cups of the Marvel Universe. Jessica Jones and Luke Cage have a daughter named after Danny Rand aka Iron Fist. And finally, Rand actually took over for Daredevil for a short period of time. These series have a great potential to be interconnected awesomeness. 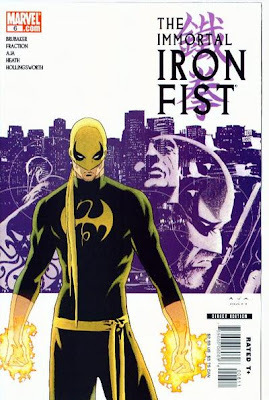 I’m not just saying that because Iron Fist is my favorite Marvel character. The strange part is the mention of the “self-sacrificing” Defenders. The way it is written makes it sound like the Defenders is going to be this team of Daredevil, Jessica Jones, Luke Cage, and Iron Fist. If it was called Heroes of Hire that would make total sense. The Defenders originally were Doctor Strange, Hulk, Namor, and the Silver Surfer. There have been a few different versions of the Defenders team and Iron Fist was on one of them. Doctor Strange has been in most of the Defenders’ lineups, so it is very possible he could be introduced in all of this. I really like Marvel’s street level characters, so to me this is probably the most exciting thing that has been announced in a while. What do you think? I'm exciting about this but for a different reason. My comics reading doesn't tend towards the super-hero books so I am only marginally familiar with these characters. However, I like the Netflix is developing original programming and I hope these shows are good enough to draw people in and then get them reading the source material.